Do consumers really care where products come from and how they are made? Is there such a thing as an 'ethical consumer'? Corporations and policy makers are bombarded with international surveys purporting to show that most consumers want ethical products. Yet when companies offer such products they are often met with indifference and limited uptake. It seems that survey radicals turn into economic conservatives at the checkout. This book reveals not only why the search for the 'ethical consumer' is futile but also why the social aspects of consumption cannot be ignored. Consumers are revealed to be much more deliberative and sophisticated in how they do or do not incorporate social factors into their decision making. 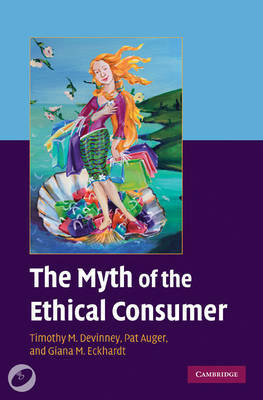 Using first-hand findings and extensive research, The Myth of the Ethical Consumer provides academics, students and leaders in corporations and NGOs with an enlightening picture of the interface between social causes and consumption.